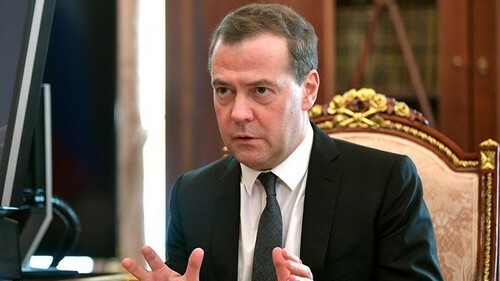 Russian Prime Minister Dmitry Medvedev backs the idea of making it a criminal offense for Russians to observe sanctions imposed by the United States, Medvedev said in an interview broadcast on Saturday on state TV channel Rossia 1. Asked about a proposal drafted by Russia’s lower house of parliament to criminalize observance of U.S. sanctions, Medvedev said the restrictions were aimed at destroying Russia’s socio-political system and harming the economy and individuals. “If this is so, then the implementation of these sanctions by citizens of our country should be an offense. No one should have the right to observe these American sanctions for fear of having to take administrative or criminal liability,” he said. Medvedev also said that the government should support sanctions-hit Russian companies to ensure that jobs are not lost. Speaking on other issues, he said that Russia was on the brink of making a decision on raising the pension age. Commenting on his own plans for the future, he said he wanted to continue working in a role that brought maximum benefit to his country.